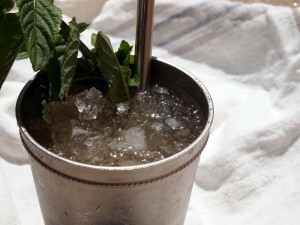 There is some controversy in the mint julep community about whether the mint should be muddled or served as a garnish. To maximize the potency of the mint (and make sure no one is happy) this recipe does both and uses mint simple syrup. In the bottom of a julep cup or collins glass, muddle two sprigs of mint and simple syrup. Fill the glass with crushed ice and add the bourbon. Garnish with remaining sprigs of mint and serve with a straw.